To support your pet's health and wellness, we offer other related services In addition to our medical, surgical, and dental services. X-rays are one of the most commonly performed diagnostic tests in both human and veterinary medicine. We are fully equipped with the latest digital x-ray equipment throughout our clinic, including our specialised dental suite. X-rays are used for the diagnosis of broken bones and to identify other conditions. They enable us to get a better "picture" of what might be going on inside your pet. It's often necessary to sedate a patient so that a more accurate diagnostic x-ray can be acquired. Sedation, which is normally short acting, allows the pet to relax and minimises discomfort. We will discuss this with you when we assess your pet's treatment needs. 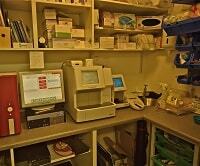 Lab tests are frequently required to help rule out or diagnose illness. Blood and urine tests allow us to assess the proper functioning of your pet's kidneys, liver, pancreas, and endocrine system including the thyroid gland and adrenal glands. 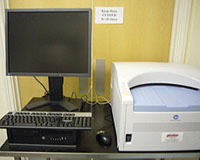 Our laboratory is equipped with the latest blood and urine analysis machines so we can perform timely analyses on-site. Endoscopy is a noninvasive procedure to see exactly what's happening inside the body. We refer your pet to top specialists for this procedure. Microchip identification is a safe and permanent way to identify your pet should he or she get lost. Our veterinary surgeon implants a small electronic microchip about the size of a grain of rice beneath the skin. The number on the chip can be read with a handheld scanner to help reunite lost pets with their families. Our on-site pharmacy is stocked with many medications, vitamins, shampoos, and flea preventives to meet the needs of your pet. We adhere to very high standards where vaccines and drugs are concerned. Medications are kept in a special temperature controlled fridge which is critical for maintaining the quality of the drugs we use on your pet. All drugs must be dispensed by a veterinary surgeon as per the RCVS (Royal College of Veterinary Surgeons) regulations. 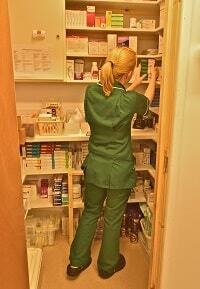 Prescription medicine is issued for a maximum of 3 months, and 28 days for controlled drugs. This guideline is issued by the Society of Practicing Veterinary Surgeons. Some pet health problems can stem from the types of foods they eat. There are a number of dietary foods and supplements available to help manage your pet's health, and we are happy to recommend the best dietary solution. 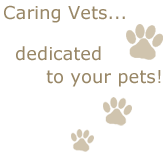 We are proud to carry the high quality Burns Pet Food line of products. Obesity causes your pet to be at a higher risk of diseases such as diabetes, arthritis, heart disease and can even shorten your pet's life. In the UK 1 in 3 dogs and 1 in 4 cats are overweight. It is important to manage their diets for their good health and to reduce unnecessary veterinary bills. 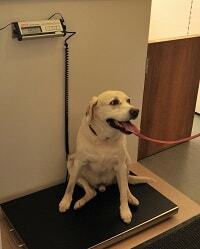 To help you manage your pet's weight, we provide a free pet weighing service with a scale available at the clinic. Please ask for assistance if you need help using the scales. Please see our Client Care Room and Euthanasia sections for more information. We provide home visit services for pet's being euthanised. This is upon special request should a client prefer to be at home with their pet at this difficult time. A home visit fee is charged. Alternatively, we provide a uniquely compassionate place for you to say good-bye to your beloved pet. We specifically designed a special room where you and your pet may sit in comfort and privacy while you say good-bye. Please see our Client Care Room and Euthanasia sections for more information. We would be delighted to have you visit us soon to see what makes our clinic special!